The passenger compartment remained stable in the frontal impact. The A6 is fitted with Audi's adaptive frontal airbags and seat belts. Sensors in the front seat rails detect whether an occupant is positioned close to the steering wheel (a small driver, for example) or more rearwards. The restraint system is tuned accordingly, using special vents in the airbags and seat belt load limiters adapted to the appropriate occupant size. In the frontal test, the system worked well and both the driver and passenger's heads were well protected. Dummy readings indicated good protection of the dummies' knees and femurs. Audi showed that the car would provide a similar level of protection to occupants of different sizes and to those sat in different positions. In the side barrier impact, the dummy indicated good protection of all body regions. However, the driver's door was found to be unlatched after the test and the car was penalised for this. In the pole test, the car provided marginal protection of the driver's chest. The seat and head restraint provided good protection against whiplash injuries in the event of a rear-end collision. 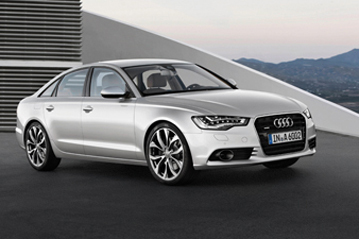 Based on dummy readings in the dynamic tests, the A6 scored maximum points for its protection of the 18 month infant. A switch is available as an option, and can be retro-fitted by an Audi dealer, which allows the passenger airbag to be disabled so that a rearward-facing child restraint can be used in that seating position. However, as the switch is not standard equipment on any model, it did not qualify for assessment by Euro NCAP. The dangers of using a rear-facing restraint in the front passenger seat without first disabling the airbag were not sufficiently clear, with only a pictogram representation on a non-permanent label. The bumper provided good protection for pedestrians' legs. However, the front edge of the bonnet was poor in all areas tested and scored no points. The bonnet was also rated predominantly as poor for the protection it offered to the head of a struck child and to the protection it offered an adult. Electronic stability control is standard equipment on the A6 and met Euro NCAP's test requirements. A seatbelt reminder is standard equipment for the driver, front passenger and rear seats. A speed limitation device is not available.